The lemons arrived on April 17th in the form of a 3 a.m. phone call, the kind of phone ringing that jars you from a sound sleep and instantly panics you that someone has died. It was a police officer delivering the news that our beach house had burned down. To the ground. There was nothing left, he said, and firefighters had been on scene for hours trying to keep the whole neighborhood from going up in flames. At first we thought it was a prank. We had been doing a major renovation on the house and had recently fired the builder—an angry, misogynistic fellow who had made every moment of the project utterly miserable. Surely this was just a sick joke by the embittered builder to aggravate us in the middle of the night. Except it wasn’t. The officer on the phone provided his badge number and the caller ID on the phone’s screen identified the East Hampton Police. This was legit. Our house was gone. We’d been there not a week before, meeting with our new builder and his crew, excited to be nearing the last phase of the construction project so we had a shot at moving in by the Fourth of July. It was crushing and surreal to imagine the house had vanished in a massive ball of flames. When dawn broke, we got into the car for the three-hour ride to the charred remains, far out on the eastern end of Long Island in the charming hamlet of Amagansett, New York. We had bought the spec house brand-new five years earlier at the depth of the economic recession, and had created many happy family memories there during summers and for holidays and vacations throughout the years. We called it “SunReiser” and even had a street marker made with the house number and name. 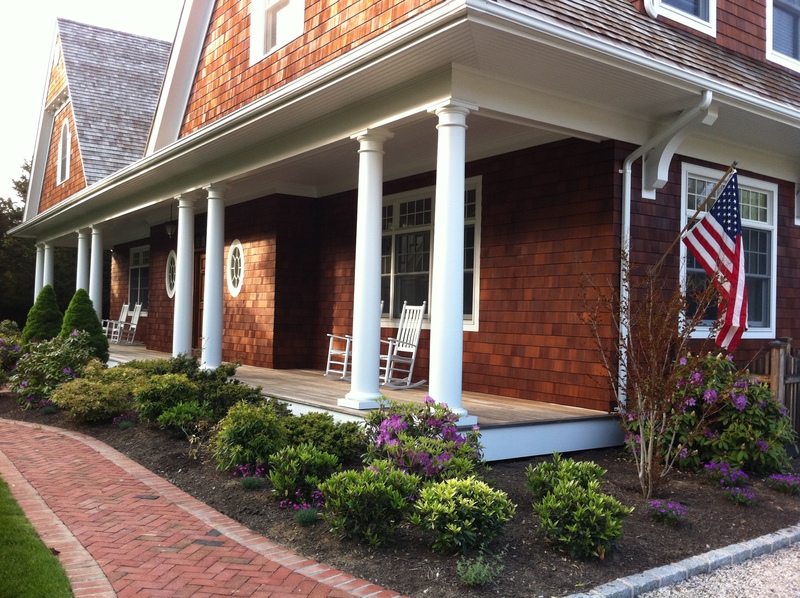 Every time we were there, we pinched ourselves that we had managed to score such a good deal in such a magnificent spot, literally a five-minute walk from two of the Hamptons’ most tranquil and exquisite ocean beaches. Our family had two beloved rituals whenever we went to SunReiser. The first was to drive to nearby Indian Wells Beach as soon as we got to town—before we’d even go to the house— as well as on our way out of town at the end of our stay. 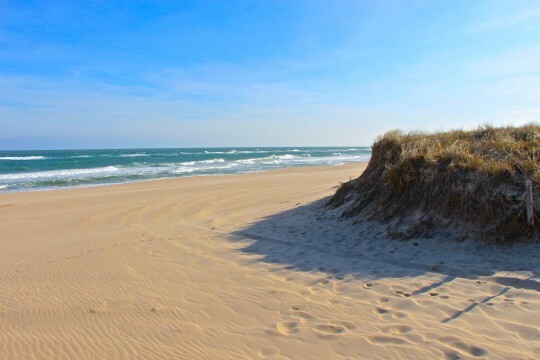 We’d pull right up to the edge of the sand and sit for a few minutes, admiring the spectacular Atlantic Ocean and gratefully counting our blessings to be living in such a glorious place. Whether it was day or night, sunny or stormy, summer or winter, that beautiful stretch of beach was always our first welcome and last goodbye. Our second ritual was to proudly display our American flag whenever we were “in residence.” We took turns handling flag privileges the moment we landed at SunReiser, ceremoniously unfurling Old Glory and planting her in the holder on the front corner of the house. Both rituals were special and important to us. When we arrived in Amagansett the morning of the fire, we made our ritual visit to the beach to gather ourselves before traveling the last two blocks to the place where the house had stood. The sun sparkled on the peaceful ocean, giving us the strength and comfort to proceed. As we turned onto our street, we saw police vehicles blocking off the road in front of our property. There was yellow crime tape at the entrance, and fire officials and detectives swarmed the area. The sight was staggering and gut-wrenching. All that stood above the smoldering embers were three red brick chimneys, one of which was still being built. A burned-out big-screen TV hung above the first-floor fireplace. Everything else had melted or turned to ash and fallen into the foundation, which itself was burned to a crisp. Our hot tub had melted unrecognizably into the seared bluestone patio, and all that was left were a couple of metal rings from inside the knobs. 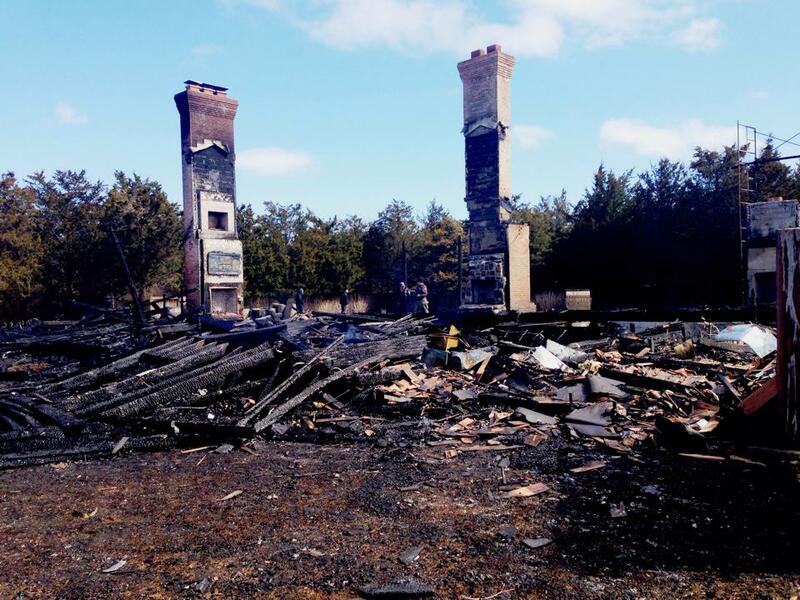 Even the massive steel structural beams that had supported the house were melted and mangled. There were embers all over the property. All over the neighborhood, in fact. We were told that when volunteer firefighters had arrived on scene at 1:45 that morning, the house was burning hotter than anything they’d ever seen, and was already a total loss. Flames shot 150 feet in the air, and they worked tirelessly to make sure the whole neighborhood didn’t ignite. As it was, the excessive heat cracked nine windows on the house next door, and with a stiff wind blowing, fiery embers melted pool covers and outdoor furniture across the street and as far away as the next street over. The hot ash started a blaze on the roof of a house across the street and was quickly contained. Blessedly, none of the 75 firefighters was injured, and they were able to prevent further serious damage to the neighborhood. For what it’s worth, we can claim bragging rights for having the hottest house in the Hamptons that night. 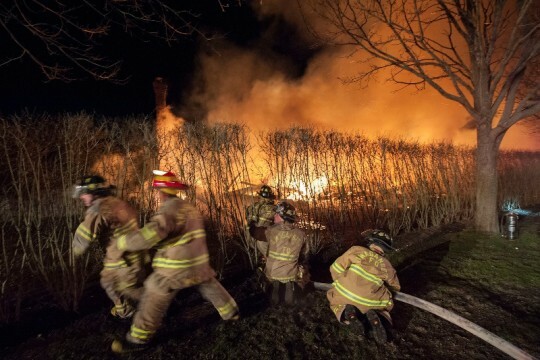 Photo credit: Michael Heller/East Hampton Fire Dept. We spent the whole day at the site, our noses filled with the aroma of smoky cedar that would normally signal delicious salmon filets wood-roasting on the grill or maybe a backyard clam roast. Instead it was the remains of our home. We provided information to police and fire officials, and the insurance adjuster showed up as well. There were no tears from me. It was just a house. My precious family was safe. Our furniture, clothes and other belonging were in storage because of the renovation. All I kept saying was that I was so grateful none of the firefighters had been hurt. In the back of our minds, of course, was the nagging thought that the disgruntled builder or one of his workers had torched the house. But the fire marshal told us he didn’t want to let his mind go there just yet because it was so inconceivable that a human being could do something so maliciously, immensely destructive. Instead, he offered a preliminary theory for the cause: an almost unimaginable series of catastrophic mechanical failures, starting with the electric line from the street. Overwhelmed as we felt, it sounded a little far-fetched to us, and anyway, it didn’t explain why a virtually empty house would burn so hot. We were still perplexed as to why the fire alarm hadn’t gone off, and suspicious about a report from a neighbor who had noticed a light on in an upstairs window at 9:30 the previous night, despite the workers insisting they had gone through the house to make sure everything had been turned off. The fire marshall said he’d await an opinion from the insurance company’s forensic investigator, a guy he knew well and respected, who’d be coming out within a day or two to check out the scene. One of my boys is taking a photography class at school, and I encouraged him to grab his camera and take a bunch of pictures of the site. “When you go back to school next week, I guarantee you’ll be the only kid with close-up photos of the aftermath of an inferno,” I promised him. When we finally left the site late that afternoon, we made our ritual farewell visit to the beach. My photographer son captured a stunning image of the dune, the sand, the sky and the azure ocean, an incongruous yet poetic end to a traumatic day. We started talking about rebuilding as soon as the ride home. Over the years, we had done considerable work to customize the house and make it our own, the last major step being the renovation project that was almost done. We had spent all winter picking out hardwood flooring, plumbing fixtures, marble and stone, lighting, appliances, carpet and paint. We had designed lovely mouldings and coffers and found an exceptional mill in Pennsylvania to manufacture them. There was gorgeous custom cabinetry being built for the kitchen, pantry and bathrooms. Now we’d be able to start from scratch and incorporate all our choices into our dream home, we reasoned. But all that changed with a phone call from a police detective on Easter Sunday, three days after the fire. We had read the news that morning that another house had burned down in a nearby town the day before, and that they had an arson suspect in custody. According to the detective, the suspect—no, not our builder, but rather a formerly wealthy, successful local he described as “mentally unstable”—described the layout of our house to a T and talked about burning it down. We had been building a detached garage on the property, and while it had windows and a roof, the doors had not yet been installed. Turns out this guy had likely been taking shelter in our garage for the previous few days. Apparently, he had been arraigned earlier in the month on a number of charges including lighting brush fires, but when he refused the public defender, he was released on the promise that he would return with his own lawyer on April 15th. When he didn’t return, an arrest warrant was issued. The next night, he presumably torched our house. We had never heard of the guy, and he had no connection to our construction project. The moment I heard the arson story, I knew we couldn’t go back. The thought of someone on your property, setting elaborate fires that would consume your house and everything around it, is traumatizing and haunting. No matter what we might have built there, we would always have the horrific memory of the burned-out foundation and the knowledge that someone had violated us so dramatically. A day or two later, the insurance company’s forensic investigator, a retired NYC fire chief from Queens straight out of Central Casting—requisite salty language and all—emphatically corroborated the arson theory. The insurance adjuster who had met us at the smoldering site the day of the fire subsequently admitted that he hadn’t bought the fire marshal’s theory of the catastrophic mechanical failure either. He told us he hadn’t wanted to say anything until the forensic investigator filed his report, but he had instantly known it was arson. That afternoon, we were asked by the police to sign an arson affidavit, stating that we didn’t know the suspect and that he had not had permission to be on our property. So what do you do when your family’s happy place is incinerated by an arsonist? You find a new happy place. Turns out our farewell ritual at Indian Wells Beach after the fire was our final farewell to Amagansett. The lovely beach picture my son took on our way out of town will remain the lasting image of our happy times at SunReiser. Instead of returning to the area, we decided to look in the southern Rhode Island community where I spent my summers…where my parents, grandparents and great-grandparents spent their summers…where my boys spent their first summers…and where my siblings and many of our dearest friends still spend theirs. 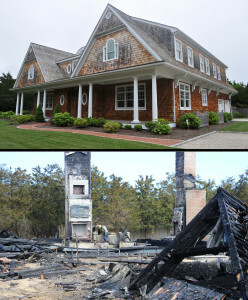 Within one week of standing heartbroken on our charred property, we had not only signed papers to buy an oceanfront place in Rhode Island, but we had made a deal to sell the land where our Hamptons house had stood as well. 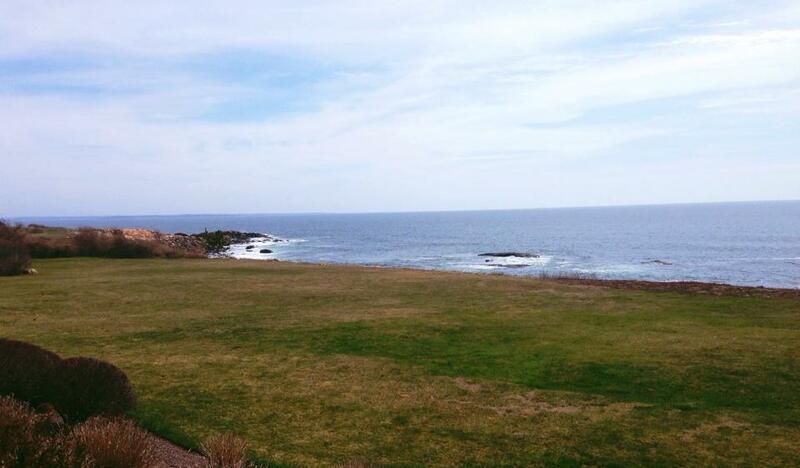 The new place is on a breathtaking spot, just a mile from where I grew up. It’s a rare opportunity we never in our wildest dreams imagined we’d be able to own, and with the insurance proceeds we hope to create a home where our family can make joyful memories for generations to come. We are truly ecstatic to have our toes back in the warm sand that means so much to us, and so grateful for where our journey has led. It’s been a shocking, fast-paced, exhausting couple of weeks to say the least. Dealing with the insurance company isn’t exactly all lollipops and rainbows. But you just have to keep on smiling and moving forward. As the saying goes, “When it’s rainy, look for rainbows; when it’s dark, look for stars.” I firmly believe you need to make every single day count and do your best to make delicious things with life’s lemons. After all, a house is just wood, metal and glass. A home is filled with people and love.